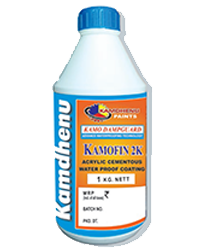 KAMOCRETE CRP is an Acrylic Polymer Based Liquid to give a waterproof protective system in cementitious composite for protective coating. Kamocrete CRP is extremely useful in water proof coating, overlays cement sand repair mortars, and you can also use it as bonding agent. 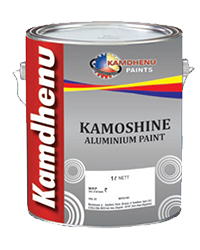 If you are looking for a highly durable and corrosion resistant paint, Kamoshine Aluminium Paint is the answer. 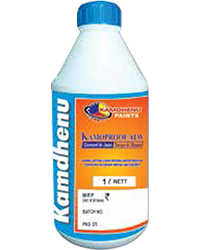 Its characteristic aluminium lustre provides a glossy, long lasting smooth finish to the surface. 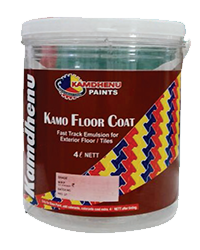 Kamo Floor Coat (KFC) is a specialized paint (based on Fast Track Emulsion) specially formulated for Exterior / terrace floor tiles, cement tiles and any walkways or plain cemented surfaces.